Lois Lowry’s 1993 novel The Giver has garnered a very wide audience over the past two decades, since it has become a standard text in middle schools and high schools across the English-speaking world. With the enormous success of the Harry Potter, Twilight, and Hunger Games films, Hollywood has been busy adapting books written for the young adult audience. The most recent example is the movie version of The Giver, which was produced by Jeff Bridges and which stars Bridges and Meryl Streep. 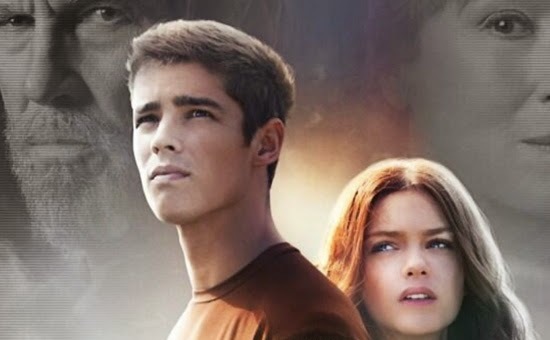 Having never even heard of the novel, I came at the film with no expectations, and I confess I was quite surprised both by the power of its societal critique and by its implicit Christian themes. The story is set in the near future, in a seemingly utopian city, where there is no conflict, no inequality, and no stress. The streets are laid out in a perfectly symmetrical grid, the domiciles and public buildings are clean, even antiseptic, and the people dress in matching outfits and ride bicycles so as not to pollute the environment. The “elders,” the leadership of the community, artificially arrange families and carefully assign vocations, all for the sake of the common good. In order to eliminate any volatile emotions that might stir up resentment or compromise the perfect equilibrium of the society, each citizen is obligated to take a daily injection of a kind of sedative. If someone’s speech veers even mildly in the direction of suggesting self-assertion or individuality, he is corrected with a gentle but firm admonition: “precision of language, please.” Most chillingly, the elderly and unacceptable children are eliminated, though the people have been conditioned not to think of this as killing but only as a peaceful transition to “Elsewhere.” The calm “sameness” of the city is maintained, above all, through the erasing of memory: no one is permitted to remember the colorful but conflictual world that preceded the present utopia. No one, that is, except the Giver, an elder who retains memories of the previous world for the sole purpose of consulting them in case an emergency arises and specialized knowledge is called for. Utopian societies, maintained through totalitarian control, have been dreamed about at least since the time of Plato, and, to be sure, many attempts have been made over the centuries to realize the dream. The twentieth century witnessed quite a few of them: Mao’s China, Stalin’s Soviet Union, Hitler’s Third Reich, Pol Pot’s Cambodia. Indeed, there are echoes of all of these social arrangements in The Giver’s version of utopia, but I think what The Giver’s city most readily calls to mind is modern liberalism, especially in its European incarnation. We find the fierce enforcement of politically correct speech, the manic attempt to control the environment, coldly modernist architecture, the prizing of equality as the supreme value, the rampant use of drugs, the denial of death, and the wanton exercise of both euthanasia and abortion. Will all of this produce a balanced and peaceful society? Well, it might bring about a kind of equilibrium, but at a terrible cost. And now we see that what makes the society in The Giver most like contemporary Europe is precisely the forgetfulness of Christianity. What the story suggests, quite rightly, is that suppression of the good news of the Incarnation is in fact what conduces to dysfunctional and dangerous totalitarianism. The source of the greatest suffering throughout human history is the attempt to deal with original sin on our own, through our political, economic, military, or cultural efforts. When we try to eliminate conflict and sin through social reform, we inevitably make matters worse. As Pascal said long ago, “He who would turn himself into an angel, turns himself into a beast.” The key to joy at the personal level and justice at the societal level is in fact the conviction that God has dealt with original sin, by taking it on himself and suffering with us and for us. This belief allows us to embrace the world in both its beauty and its tragedy, for we see salvation as God’s project, not our own. It is the Incarnation—the event celebrated by the singing of “Silent Night”—that frees us from our self-importance and gives the lie to our programs of perfectibility. I can’t help but think that the recovery of this lost memory—so key to the authentic renewal of contemporary society—is what The Giver is finally about.